Dave Blaska, Right wing Republican blogger, is running for the Madison School Board Seat 4. David is running against Ali Muldrow. To many in Madison, Dave Blaska's name will sound familiar. 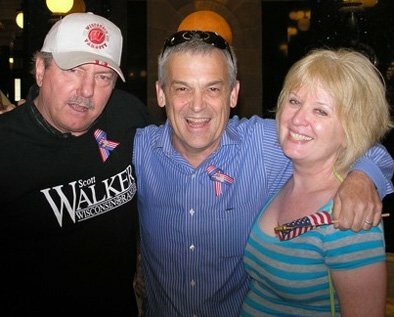 He has been a stalwart on right wing hate radio Vicki Mckenna's show, and a local blogger. Now that Dave, a former State Employee, is retired, he has all day to accost, anyone who supports public education. Plenty of ways to keep the Section 8s out of units. .... Just keep using creative ways to dodge them and you'll get a good renter in there soon enough. It may hurt your pockets some initially, but it'll definitely payoff in the long run. Potential School Board member Blaska is offering "helpful advice" on how to "legally" discriminate. Blaska also proudly concealed carries a weapon, which is dangerous in the hands of someone who is perpetually offended and scared. Blaska also believes in regulating everything a teacher does all day, especially the women. Blaska also looks up to Bill Cosby,which explains why Blaska's highlight of attending Scott Walkers Inauguration Gala, was creepily staring at cleavage! The most egregious act of Blaska's though, was when he teamed up with Wisconsin Law & Liberty(a right wing, Bradley funded group who is known for filing frivolous lawsuits), and sued the Madison Metropolitan School District. Right-wing blogger and professional cranky old man David Blaska has filed suit against the school board, the school district and the Madison teachers union for wasting his tax dollars by signing an employment contract. Blaska's complaint, filed by the Wisconsin Institute for Law and Liberty (WILL) -- a nonprofit law firm almost wholly funded by the right-wing Bradley Foundation -- accuses the board, the district and the teachers of "unlawful collective bargaining." Under Gov. Scott Walker's Act 10, the court filing points out, teachers and other public employees are not allowed to bargain over terms of employment, working conditions, merit pay, benefits and any other items beyond cost-of-living increases on base pay. Blaska, "whose taxes are used to fund the school district," the complaint observes, is also filing his suit on behalf of the teachers, whose rights are being violated by their union, he claims, since they are being unlawfully represented. The lawsuit was completely without merit and thus was dismissed, but not until after too much time and money wasted on the frivolous challenge. Now that Blaska is running for the MMSD School Board, he sees a problem when the district does not punish "those kids" to the fullest extent of the law - and beyond. As he says, one of the problems he wants to solve is: If they can’t keep order at a school board meeting, imagine the chaos in the classroom! Yet Blaska fails to mention that there is chaos at School Board meetings because he creates the chaos. Blaska is not in the race for betterment of the district, the kids, or the taxpayers. David Blaska is in the race to make his name as a charter school hero, so he will create a circus to make sure people are paying attention. 4. Name three things you believe the MMSD needs to improve. Classroom Discipline. Return control of the classrooms to teachers. More charters (call it “one thousand points of light”) One size does not fit all. Lose the fixation on identity politics. More charters, equals less money for MMSD and the kids who desperately need it. Trust teachers to control their classrooms. They are the captains of their ship. Because good teachers are quitting in frustration. Teachers with high expectations for their students, who do not make excuses, ought to be honored — not vilified. Yet everything ACT10 was designed to do, and all of the many hours Dave has spent on hate talk radio decrying the teachers unions as the downfall of society and now he wants to recognize teachers as leaders? Because reformers like Mike McCabe — a former spokesman for MMSD! — are applying to Scott Walker’s Office of Educational Opportunity for charter schools instead of to MMSD. I haven't applied to any Office of Educational Opportunity or anything else related to charter schools. Why Mr. Blaska would need to make up things like this is beyond me. I do know for certain that for the good of the children in Madison, please vote for anyone else! Jeff m'boy, ever wonder why Tony Evers is not laying a finger on Act 10? After all those protests, after all your whining, the first Democrat to succeed Scott Walker is (gulp, GASP!) allowing Act 10 to remain law. Not a single amendment? Your thoughts, please. Unlike Trump, he realizes legislative approval is needed to change laws. I predict Blaska will lose on Tuesday because no one is in favor of trolls serving on school boards. How does that explain Jeff Simpson? Sorry Dave, but in order for you to win you'll need overwhelming support from the deplorables, and as you will surely realize come Tuesday, there's just not enough racist dickheads within the voting district. Yet, somehow, Madison schools are "institutionally racist"? Explain that one, name caller. Well, if in fact they are "institutionally racist", it seems apparent that putting a racist dickhead on a board that oversees them would only exacerbate the problem. Hilarious Li'l Jeffie, watching your hopeless effort, replete with spittle-flecked slobbering, to throw off your suffocating White Lefty Guilt and try to appear to be DOWN with the minority community. You also neglect to include that Ali "No Public School For MY Brood" Muldrow wants kids to be able to whip out their ObamaPhones©™® whenever they take a notion AND put the taxpayers on the hook for the legal representation of future democrat voters, I mean, habitual classroom/school/offending micreants? Because that'd be SOOOO unlike you to go off half-cocked, am I right? "there's just not enough racist dickheads within the voting district." Seems to be a surfeit of impressionable, victimhoodied, Lefties-in-Training that will easily be herded with the promise of more More MORE high quality/quantity free $#!t. I certainly hope you didn't write something in that blog that is libelous. You sir need to let go of your irrational hate. One of your lies that jumped right out at me is this one, "Yet Blaska fails to mention that there is chaos at School Board meetings because he creates the chaos." Blaska creates the chaos? That's a full load of BULL! Even the video you linked to does not support your ridiculous claim, it supports Dave's claim. Dave shares his opinion in a public forum in a calm manner, the lunatic social justice warriors in the room erupt in attack the messenger lunacy and drag the meeting into the abyss, and the board basically does nothing to put a stop to the social justice warriors attacking the messenger. It's chaos and Dave didn't create it. The board, sit's there and let's the meeting go in a rabbit hole that the social justice warriors drove it in. Your either too stupid to understand that our your intentionally lying. Which is it Jeff, are you stupid or a liar? Oh wait, I think I finally get it Jeff, this whole blog post attacking Dave Blaska is nothing but an April Fools "joke". Good one Six, but Li'l Jeffie is TOO self-UNaware to be funny; he'd pull something. Also; if it was supposed to be an April Fools joke then he failed at that too, he posted the blog on the 27th of March. Macho man Blaska (aka, Snowflake) goes down hard in crushing defeat! ... and still no rebuttal from Dave Blaska, insisting that he actually WON the election!... What can be causing this incredibly long delay?